Comment trouver de la croissance sur le marché des compléments alimentaires ? L’Odyssée végétale, le blog de Purextract®, aime bien recevoir des invités, surtout lorsqu’il s’agit d’expert dans leur domaine. En Juillet dernier, c’est Philippe Millet, rédacteur en chef de Actifs Magazine, qui nous parlait du marché européen des compléments alimentaires à base de plantes. Aujourd’hui, nous accueillons, avec un plaisir non dissimulé, le Dr A. Elizabeth Sloan de SLOAN TREND qui analyse avec beaucoup de pertinence et de justesse le marché des produits naturels aux Etats-Unis. Pour faire écho à notre précédent article les consommateurs, qu’ils soient nord-américains ou européens, plébiscitent le « Clean, Safe & Effective ». Purextract® a depuis longtemps fait sienne cette devise…mais laissons la parole à Liz ! Older active adults, a fear of all things artificial and more natural so­lutions for minor ailments will drive the marketplace. It’s no longer business as usual. But de­spite the tough year for supplements, new consumer attitudes/practices, health is­sues and a rising fear of all things artificial are creating a bevy of new health-focused nutraceutical opportunities. An unprecedented demand for more natural health solutions, a fundamental shift toward food and naturally functional food-based ingredients, as well as de­mand for cleaner, safer and more effective products are the underlying forces set to redefine the nutraceutical market. Hydroxytyrosol (heart, reduces arterial plaque formation), French maritime pine bark (circulation, anti-inflammatory,prevents oxidative stress); astaxanthan (heart, lowers blood pressure, prevents oxidative stress) and pterostilbene (heart, lowers blood pressure, prevents oxidative stress) are among the up-and-coming scientifi­cally-supportable phytonutrients. With the U.S. lifespan now 81 years for women and 76 for men—and 29 million people now aged 70–87—a large new market focused on concerns of much old­er Americans is taking shape.32 Stroke, mobility, joint, muscle mass/strength/sar­copenia, memory/cognition, Alzheimer’s, diverticulitis, regularity, weight mainte­nance and pain will continue to move into the spotlight. Lastly, from laborers to those who stand on their feet (e.g., waiters, computer desk­jockeys) workers are a virtually untapped supplement demographic. Dietary supplements reached $36.8 bil­lion in 2014, up 5.1%, and are projected to reach $46.6 billion by 2018.6 Meal supple­ments tied with sports supplements as the fastest growing segments, both at 7%. Matcha (heart health, blood sugar and blood pressure regulation) and mush­room species including Maitake (immu­nity, modulate blood sugar and insulin response), King Trumpet (antioxidant L­ergothioneine, cholesterol management, bone health), Cordyceps (energy, respira­tion) and Reishi (immune, heart health) are other up-and-comers. These “free-from” markets will likely re­main niche. It is worth noting that scanner data, which simply tallies sales of products that carry a claim, does not measure “in­tent to buy” and will continue to deliver unrealistic inflated sales figures that mis­represent these free-from market oppor­tunities as it did with gluten-free. Nearly half of consumers (50%) look for snacks that have additional health ben­efits beyond nutrition.60 One in five buy snacks for an energy boost or to improve their mood; 17% do so to manage weight. Farm/estate branded items, environmen­tal sustainability, natural ingredients/mini­mally processed food and hyper-local sourcing are among the chef’s hot culinary trends for 2015.62 Organic is no longer mentioned in their top 10 culinary trends. Johnsen, 2014. Cold-Cough Switches Drive Growth. Drug Store News 37(3):1. Johnsen, M., 2015. Supplement Users Healthier, Shop More Frequently. Drug Store News 37(1):26-27. CHPA, 2010. CHPA. Your Hand at Health: Perceptions of Over-the-Counter Medicine in the U.S. Nov. 24, 2010. Con­sumer Healthcare Products Assn., Wash­ington, C. www.chpa.org. Johnsen, M., 2015. Consumers Stock Up Prior to Cold, Flu Season. Drug Store News 37(3):3. Workplace Impact, 2015. New Study Finds Working Women Focused on Health, Wellness. Press Release: Feb. 10, 2015. WorkPlace. Cleveland www.workpla­ceimpact.com. Nutrition Business Journal, Data sheets and NBJ issues 2015. www.newhope360.com. Sloan Trends, 2015. TrendSense Model. Sloan Trends, Inc., Escondido, CA. sloantrend.com. MSI, 2013. The 2013 Gallup Study of Nutrient Knowledge & Consumption. Multi-Sponsor Surveys, Princeton, J. www.multisponsor.com. Johnsen, M. Awaking a Sleeping Giant. Drug Store News. 37(6):6. Johnsen, M., 2015. Niche Brands Bring Relief to Pain Category. Drug Store News (37(3):6. 11. Clarke, C.T. et al., 2015. Trends in the use of complementary health approaches among adults: US, 2012-12. National Health Statistics Reports. No 79. Feb. 10, 2015. National Center for Health Statistics, Center for Disease Control and Prevention. MSI, 2014. The 2014 Gallup Study of Nutrient Knowledge & Consumption. Multi-sponsor Surveys, Princeton, NJ multisponsor.com. Hartman, 2010. Ethnographic Research Supplement Study. Re-imagining Health & Wellness. The Hartman Group, Bellevue, www.hartman-group.com. 2014. 2014 Functional Food Sur­vey. International Food Information Coun­cil Foundation, Washington, D.C. www. foodinsights.com. 2014b. “New Product Pacesetters.” Times & Trends, April. Information Re-sources, Inc. Chicago, IL. www.infores.com. 2013. HealthFocus U.S. Trend Study. HealthFocus International, St. Petersburg, FL www.healthfocus.com. Euromonitor, 2014. Health and Well­ness Performance Overview, March. Lon­don, K. www.euromonitor.com. MSI, 2014. 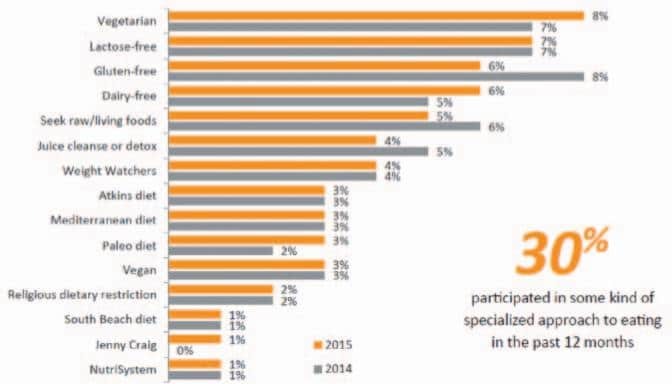 The 2014 Gallup Study of the U.S. Market for Vitamins & Other Di­etary Supplements. Molyneaux, M. 2013. Consumer trends: an up-to-date analysis. Presented at Council for Responsible Nutrition Ann. Mtg., La­guna Beach, CA. 2013. 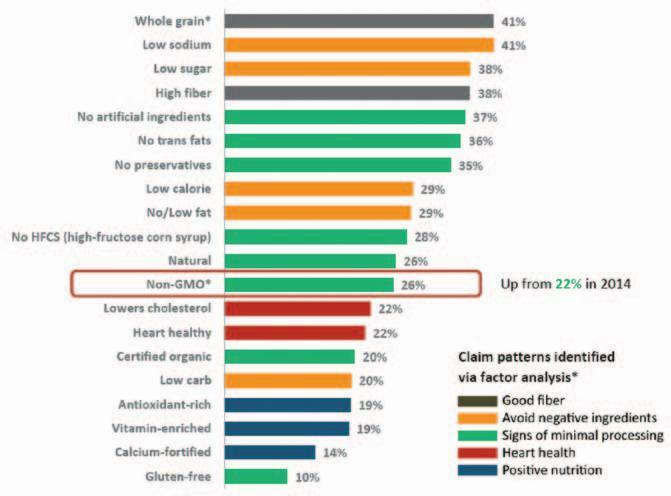 The 2013 Gallup Study of Clean Food & Beverage Labels. 2015. 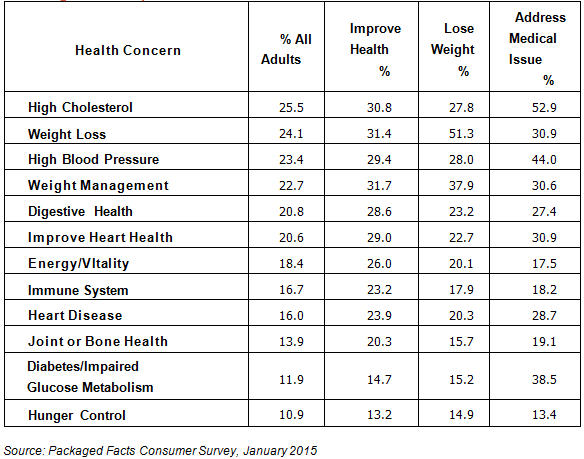 2015 Food & Health Survey. OTA, 2015. 2014 Sales of Organic Foods and Beverages. Organic Trade Assn., Washington, D.C. www.OTA.com. 2014. The Organic Report. The Hartman Group, Bellevue, Wash. www. hartman-group.com. FMI 2015. FMI. U.S. Grocery Shopper Trends. Food Marketing Institute, Arling­ton, VA. fmi.org. IMS, 2015. Medical Use and Spending. IMS Institute for Healthcare Informatics. Danbury, CT. April. Accent health, 2014. Vitamins, Minerals & Supplements: The Role of the Physicians. October. Euromonitor, 2014. Weight, Sports Nu­trition & Dietary Supplements. Press re­lease; July 10, www.euromonitor.com. Euromonitor, 2014. Probiotics and Be­yond Datagraphic. S. Census. 2010. U.S. Census Bureau, Washington, D.C. census.gov. Packaged Facts, 2014. Nutritional Sup­plements in the U.S., June. 2014a. “Aging America: Carving Out Growth in Mature Markets,” Times & Trends, June. 2014d. Nutritional and Per­formance Drinks—U.S. January. Mintel Group Ltd., Chicago, mintel.com. 2010. “Low Income Report.” New Product Pacesetters. Oct. Information Re-sources Inc., Chicago. www.iriworldwide.com. 2015. “Capture and Keep Your SNAP Shopper.” Presented at IRI 2015 Summit, April 20–22, Austin, Texas. MSI, 2011. The 2011 Gallup Study of Hispanic Nutrition & Supplement Use. 2013. Hispanic Diet and Well­ness—U.S. March. Packaged Facts, 2014. The Kids Food and Beverage Market in the U.S. January Rockville, MD www.packagedfacts..com. , 2015. Choline: An Important Nutrient Most Overlooked, Institute of Food Technologists’ Annual Meeting. July 12, Chicago, IL. Lindstrom, A. et al. Sales of Herbal Di­etary Supplements Increase by 7.9% in 2013. Herbalgram No.103. Aug. – Oct. p. 52-56. Mintel, 2012. Gastrointestinal Remedies – US – April 2012. Johnsen, M. 2015. Major Brands Extend Allergy Portfolios. Drug Store News Dec. 15, 2014. P. 60. Johnsen, M. 2015. Niche Brands Break through Retail Clutter. Drug Store News 37(5): 40. Johnsen, M. 2015. Growth in Four Need States Across VMS. Drug Store News 37(3):7. Johnsen, M. 2015. More Shelf Space Linked to Higher Sales. Drug Store News 37(1):22. AHA, 2015. AHA. 2015. “Heart & Stroke Statistics 2015.” American Heart Assoc. Dallas, www.heart.org. IMS, 2015. National Prescription Audit. Jan 2015. IMS Institute for Healthcare In­formatics. Danbury, CT.
American Menopause Assn., Statis­tics. www.menopause.com. FMI, 2014. U.S. Grocery Shopper Trends. FMI, 2015. The Power of Meat. Packaged Facts, 2014. Functional Foods. February. 2014c. Healthy Eating Con­sumer Trend Report. Technomic, Chicago. www.technomic.com. Jacobsen, J. 2015. “2015 New Product Development Outlook.” Beverage Industry 106(1): 56, 58-60, 62, 64, 65. Wyatt, S. Lyons. The State of Snack­ing. IRI Summit Presentation. Austin TX. March 31, www.iriworldwide.com. Hartman Group, 2015. Health & Wellness. NRA, 2014. What’s Hot Chef Survey? National Restaurant Assoc., Washington, C. restaurant.org.